London [UK], July 13 : United States President Donald Trump on Friday said a leading British tabloid didn't convey his message well following with he had to tender an apology to British Prime Minister Theresa May. In the interview, Trump said that Theresa May had ignored his advice on Brexit. "I didn't criticise the (British) Prime Minister. I have a lot of respect for the Prime Minister. And unfortunately, there was a story that was done, which was, you know, generally fine. But it didn't put in what I said about the Prime Minister. And I said tremendous things," Trump said at a joint press conference with May here. He noted that he has a recording of the interview to support his argument, CNN reported. "Fortunately, we tend to record stories now, so we have it for your enjoyment if you like it. But we record when we deal with reporters. It's called fake news," he added. 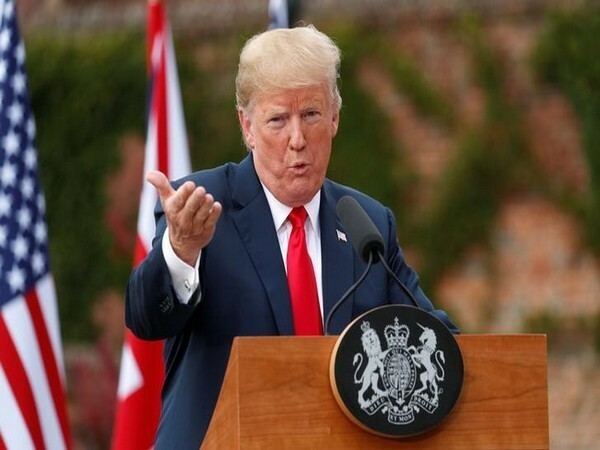 President Trump further stated that he apologised to Prime Minister May this morning over the interview. "She's a total professional. I said, 'I want to apologise because I said such good things about you,' And she said, 'Don't worry, it's only the press,'" Trump said. Trump added that he wished the paper put the "tremendous things" he said about May in its headline, but acknowledged, "That's one of those things." In his interview with a leading British newspaper, Trump said May had ignored his advice on Brexit. He reportedly also said May's cherished hope of a free trade deal with the US would be killed off by her softened approach. Meanwhile, mass protests are being held against Trump in London over his maiden visit as the US President to the United Kingdom. Trump and his wife Melania are on a four-day trip to the UK.